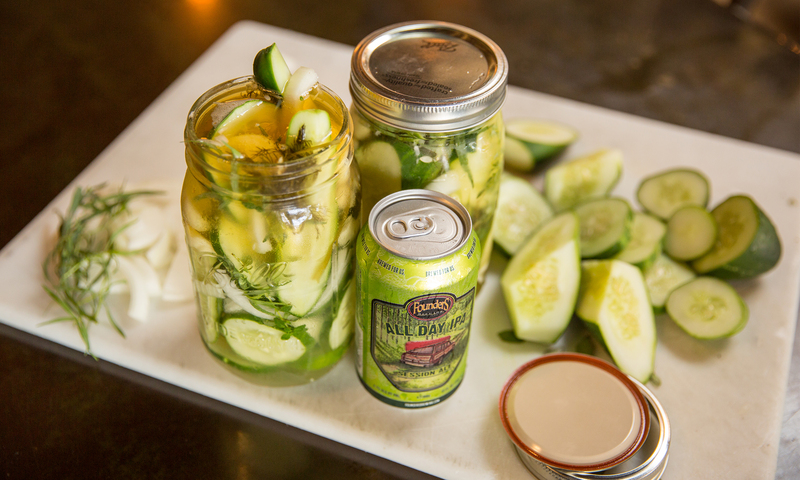 All Day IPA Quick Pickle Recipe - Founders Brewing Co.
Posted on July 29, 2016 by Founders Brewing Co.
Fresh from the farmer’s market or your very own garden, ’tis the season for fresh cucumbers. And if you’re like us, this means your craving for crisp, refreshing pickles is at an all-time high. To quickly satisfy that craving, our head chef, Justin, put together a quick pickle recipe, also known to some as “refrigerator pickles.” The twist? A delicious All Day IPA brine, of course! You can follow all of the same steps for traditional canned pickles until it comes time for the actual canning and storage – then you’ll need to properly sterilize your jars. But, we digress. This here is all about instant pickled gratification, friends. Let’s do this. In a large stock pot on your stove-top, combine water, vinegar, All Day IPA, honey, garlic, peppercorns, coriander, and salt. Bring to a simmer or light boil, until the salt dissolves. This is your brine. As you wait for that to come together, pack your jars with evenly dispersed amounts of: cucumbers, onion, dill, tarragon, and thyme. Pull the brine from the stove, and allow to cool slightly (5-10 minutes). Now, unless you are aces when it comes to pouring liquid from one container to another, grab yourself a funnel, and begin to fill the jars with the brine until everything is covered. Let the jars cool to room temperature completely, screw on the lids, and put in the fridge. Eat these up within the week. Enjoy!